Bernd Bocian, PhD, was born in 1954 and lives in Genoa, Italy. He works in private practice as well as in a Cooperativa Soziale. He is a gestalt therapist, and was also trained in Reichian bodywork and psychoanalytic therapy. From 1985 to 2000 he was a member of the editorial board of the German journal Gestalttherapie (ed. by DVG – Deutsche Vereinigung für Gestalttherapie - German Association for Gestalt Therapy). He is author of various publications on the history and contemporary relation between gestalt therapy and psychoanalysis. Using Fritz Perls as an example, this book recalls the representatives of an urban avant-garde culture who were expelled from Europe and forced to emigrate. The formative years of these social outsiders and pioneers of modernity began with the trauma of the First World War and extended into the Weimar Republic and their exile from Nazi Germany. In 1933, physician and Freudian psychoanalyst Fritz Perls fled from Berlin to the USA where, in his later years, he would become the central founding figure of Gestalt therapy. Fritz Perls in Berlin focuses on the background of Perls’s life before he was forced to leave Germany. The book sheds light on his social, cultural, and political spheres of experience, and it describes the influence that Expressionism, Dadaism, culturally critical psychoanalysis, the theater of Max Reinhardt, Gestalt psychology, and Hegelian Marxism exerted on Perls during the 40 years he lived in Berlin. By analyzing the life context of the émigré generation, the author demonstrates clearly that their suffering and richly creative lives still hold an important message for the future. 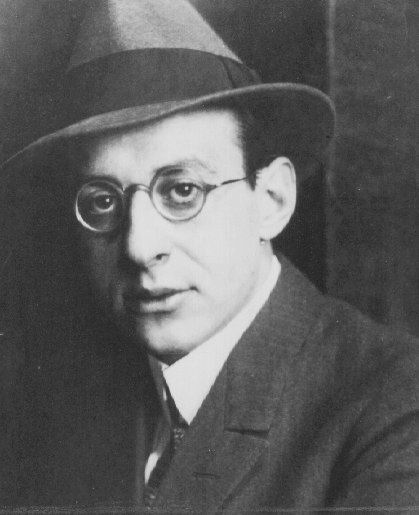 Fritz Perls in Berlin 1893-1933. Roses are reddish, violets are blueish. On the first page of his autobiographical outline, Fritz Perls calls himself a »lower middle class Jewish boy« (Perls 1977,1), and the collection of memories published by Gaines contains reports that even in his final years he continued to come out with Yiddish sayings and rabbi stories (see Gaines 1979, 338 f.). His grandparents were religious, as was his mother and possibly also his oldest sister, Elisabeth, who worked as a secretary for the Jewish community in Berlin. His father appears to have been an emancipated and enlightened assimilated Jew whose sole orientation was the abstract religious humanism of the Free Mason movement. As a boy, Fritz Perls learned Hebrew in preparation for his Bar Mitzvah, a ceremony through which he came of age in a religious sense at thirteen. The preparatory instruction at the synagogue was »impersonal« (Perls 1977, 249) and the ceremonies in the synagogue remained »strange and peculiar« to him (ibid.). Yet by being bar mitzvahed, Perls received more instruction in the Jewish religion than Sigmund Freud, for example, (see Gay 1988,131) although like the latter he remained an »unbelieving Jew« (Freud in Gay ibid., 133). Since the Jewish context5 of Perls’s life has not received close attention until now, I would like to begin this monograph by providing basic information on the situation of Jews in the German Empire up until the time that Perls was born. 4.3 The Front Line, Gas Warfare, Death. One day later - we were exhausted and had been shaken to the bone - we heard a peculiar throbbing, an unceasing drone, still from faraway. It made the window panes in our train compartment rattle quietly. It was the front line. Fritz Perls, a 23-year-old medical student, was assigned to the 36th Combat Engineer Battalion as a medic and advanced, according to his own reports, to the rank of First Lieutenant. The trenches of Flanders, Belgium, were his front line, and his battalion was a »unit especially trained for attacking the enemy with poison gas« (Perls 1977,122). These attacks on the human environment for the purpose of killing human beings were the first ever to be based on systematic scientific planning. By participating in them, Perls experienced the moment when classical warfare turned into a certain form of terrorism: »Terror operates beyond a naive exchange of armed attacks between regular troops. Its goal is to replace classical forms of fighting by destroying the enemy’s vital environmental requirements« (Sloterdijk 2002, 14).47 Gas attacks shifted the destructive intent to the environment, that is, to the air enveloping the enemy. It seems to me that in the trenches of the First World War Perls discovered the environment, in Sloterdijk’s terms, and experienced at an existential level the importance of the unity of the organism and its surroundings. On April 22, 1915, the winds were favorable. The gas was released from 5,730 steel cylinders and drifted toward the enemy trenches at a width of 6 km. The effect was dreadful . . .
“This book is an important and interesting contribution to the history of the psychoanalytic movement and the definition, history, and literature of gestalt therapy by a prominent German gestalt therapist with Polish roots currently living in Italy. Bernd Bocian has made a number of excellent contributions to the historical relations between psychoanalysis and gestalt therapy. His book is also a fascinating glimpse into other histories: leftist innovators and pioneers in psychoanalysis, such as Wilhelm Reich; the counter culture movement in the Weimar Republic, such as the expressionism; (...) Perls’ participation in these avant-garde milieux and collaboration with the Dadaist movement became an inspiration for his counter-culture activities in the United States and his teamwork with Paul Goodman, the Greenwich Village guru and leader of the youth protests of the 1960s and 1970s. Bocian also illuminates German-Jewish relations (...) which resulted in the forced mass emigration of Jewish intellectuals and psychoanalysts . . .